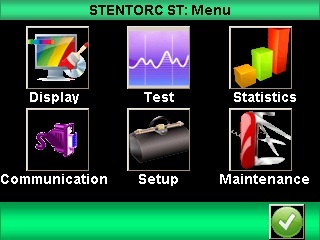 Centor Star Touch is designed for manufacturing environments, providing performance and easy operations to use and understand with the addition of the new, colored touchscreen technology. 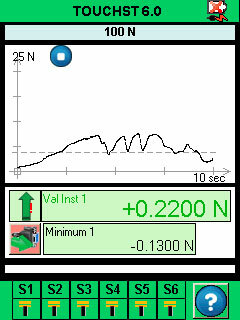 icons guide the operator in the selection of the appropriate measurement technique and method for their application. Setup menus, prompts and results are available in multiple languages (French, English, German Spanish). New! Bluetooth - With the Bluetooth module (sold separately), you can remove the connection cable between the computer and the gauge. USB data recorder With the USB Datastick II (sold separately), you can now save all your measurements and graph directly to a USB memory without connecting to a computer. On demand: data transmission request from a computer to retrieve the device memory or tare. Analog sending data continuously at 100 Hz with a voltage of +/- 1.25V. TTL Interfaces your gauge with a PLC - The Centor Touch Dual model can easily be integrated to an industrial assembly line thanks to its programmable TTL 6 outputs and 2 inputs. Industrial robots are controlled by automate using triggers signals which can be generated through the digital ports of the Centor Touch Dual. The SPIP Technology enables to store in the sensor its calibration and recognition settings. Equipped with SPIP, the force and torque sensors can be read directly by the Centor Star Touch gauges. Therefore you can increase your measuring range or your inventory of instruments cost effectively in buying just the force or torque sensor you need. You can have a force gauge and a torque gauge with just one unique display. Thanks to its whole package of functionalities, its flexibility and its simplicity of use, the Centor Star Touch is the ideal solution in the production or for quality controls, for simple or more complex tests but conomically realistic. SPIP S2 series square force load cells are automatically recognized by all CENTOR TOUCH STAR and DUAL force gauges and torque gauges.They complete force and torque measurements at a very reasonable price. This handle reaction torque sensors is designed to check and measure torque on screws, bolts, tools; it's easy to use thanks to his ergonomic design. No more cord . 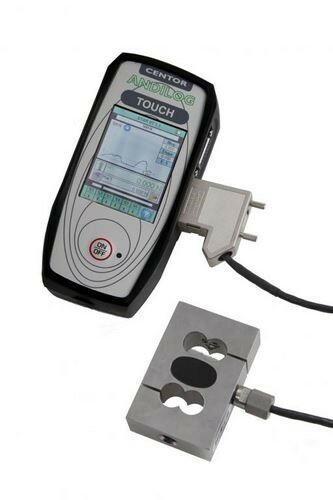 ANDILOG’s force and torque Centor TOUCH gauge integrrates Bluetooth technologies and give you wireless freedom. 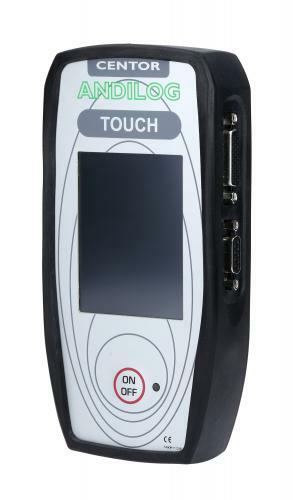 This option allows you to connect your Centor Touch to your computer and use our software RSIC Lab II or Caligraph without having to physically attach it with a cable. Just pop the Bluotooth dongle to the gauge, and enjoy the reliability of a wired revices coupled with the satisfaction of a cord free Force/Torque handheld gauge.